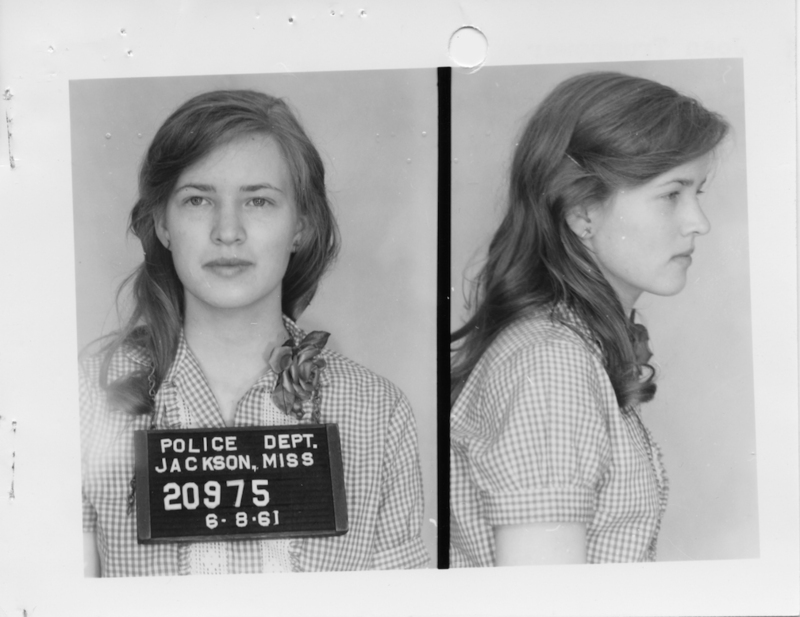 Mug shot of Joan Trumpauer, freedom rider from North Carolina (Mississippi Department of Archives and History, Archives and Records Services Division [#2-55-3-85-1-1-1]) Credit: Courtesy of the Mississippi Department of Archives and History. Freedom Rides, undertaken by the Congress of Racial Equality (CORE) in 1961, were designed to test the US Supreme Court’s 1960 ruling in Boynton v. Virginia that segregation of facilities in interstate bus terminals violated the Interstate Commerce Act. The first two groups of Freedom Riders left Washington, D.C., on 6 May 1961, bound for New Orleans, where they planned to attend a 17 May rally celebrating the seventh anniversary of the landmark Brown v. Board of Education decision. The Trailways and Greyhound buses made their way relatively peacefully until they reached Alabama. They encountered violence at Anniston, where mobs burned one bus, and at Birmingham and Montgomery, where angry mobs attacked and severely beat many of the riders. After the violence in Birmingham, many of the riders chose to continue on to New Orleans by airplane, and Student Nonviolent Coordinating Committee (SNCC) activists stepped in to continue the journey by bus. US attorney general Robert F. Kennedy arranged for federal marshals to protect the riders as they traveled between Birmingham and Montgomery. For the journey to Jackson, Mississippi, state law enforcement officials agreed to protect the riders; in exchange, Kennedy agreed not to intervene when Jackson police arrested the riders. This behind-the-scenes deal displeased the Freedom Riders, who believed that Kennedy should have supported their right to use integrated facilities. On the journey from Montgomery to Jackson, the bus bearing the Freedom Riders was escorted by a caravan of highway patrol cars, FBI spotter cars, helicopters, and US Border Patrol airplanes flying high-altitude reconnaissance in response to threats to bomb the bus. Jackson police then arrested the riders when they attempted to integrate the bus station waiting room. The riders refused bail and pled guilty to charges of breaching the peace, choosing to serve their thirty-nine-day sentences in the hopes that the preservation of segregation would become too expensive for white Mississippi to maintain. Over the course of the summer, police arrested 328 Freedom Riders in Mississippi, two-thirds of them college students, three-quarters male, and more than half black. When the Jackson city jail could no longer hold all the arrestees, authorities transferred many of the riders first to the Hinds County Prison Farm and later to the maximum-security wing at Parchman Penitentiary. There the prisoners endured sweltering heat and excruciating boredom. When they sang freedom songs, prison officials took away mattresses as punishment. On 7 July 1961 the last riders were released from Parchman. As a result of the Freedom Rides, CORE and SNCC eclipsed the National Association for the Advancement of Colored People, which did not support the rides, as the leading civil rights group in Mississippi. The US Justice Department subsequently worked quietly with movement leaders to steer activities toward voter registration, which officials believed would have less incendiary effects.